Each year, Panyaden donates the net proceeds from our annual Blossom Market to a chosen charity in Chiang Mai. 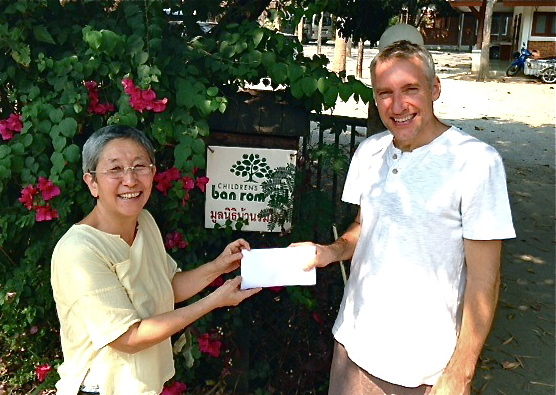 This time we collected 8,000 baht from parent donations and proceeds for Ban Rom Sai, an orphanage situated close to the school in Nam Phrae district for children who have lost their parents to due AIDS or have contracted HIV from a parent. The organisation provides a family environment in a safe, natural setting for 30 children aged between 2 and 17. Thank you for your generosity and for giving the children a chance. This entry was posted in Featured Posts, Others and tagged Ban Rom Sai, Blossom Market, charity, chiang mai, HIV, Panayden, school.